In order to build math readiness skills, young children need to participate in preschool math activities that develop certain basic skills. One of the best and easiest ways for preschool kids to develop this foundation for later math skills is by using common household objects as manipulatives. Make progress slow and steady by working small activities into the daily routine instead of making one afternoon "math time." 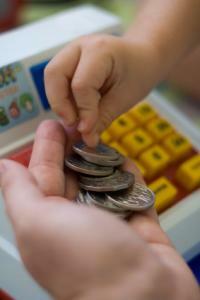 In everyday situations, ask your child to identify which has more or less. Keep in mind that it's important to stick to the basics first before trying to show your child that a bigger container may actually have fewer items in it. Create a pile of items in front of you. Ask your child to make another pile that contains more than you have. You can also work on identifying "bigger" and "smaller." Begin with items that are obvious, such as your car and a bike. As he begins to understand this concept, you can use items that are closer in size, like toys or brownies cut into different sizes. Number concept books are a great way to introduce number recognition and sequencing skills. My First Look at Numbers by Random House is a simple preschool book that reinforces the number symbols and forward sequencing. Ten Little Ladybugs by Melanie Gerth and Ten, Nine, Eight by Molly Bang both reinforce backward sequencing. Counting songs and rhymes are another fun way for preschoolers to learn number words. "Ten Little Indians" is a well known song preschoolers love to sing. Children should use their fingers to represent each number as they say it. This song reinforces forward sequencing, which is the precursor to addition. "Ten in the Bed" is a great song for practicing backward sequencing, as is "Five Little Monkeys." Learning backward sequencing is just as important as forward sequencing because it is the basis for learning subtraction. For more learning songs and rhymes, visit Songs for Teaching. Take a simple egg crate and number the bottom of each space with permanent marker from one to ten. The last two spaces can be cut off or left blank. Give your preschooler a plastic bag full of any small, interesting items like mini-M&Ms, jelly beans, beads, dried peas, pebbles, etc. You will need at least 55 items. 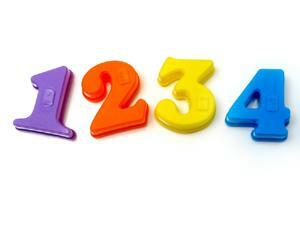 Have your child match the number of items to the corresponding number in each space. To make the game more fun and challenging, and to develop fine-motor skills, have the child use child-sized plastic tweezers to place the items in the cups. Children can also use the same items to fill plastic Easter eggs with numbers on them. After watching the movie "101 Dalmatians," children might love this preschool math game. Draw a simple dog pattern and copy it ten times on white paper. Include a dog collar on the dog's neck with a name tag. Name each dog from one to ten using numbers instead of words. Have your preschooler use a black crayon to draw the matching number of spots on each dog. Cut ten large circles out of cardboard and write a number on each from one to ten. Laminate the circles to make them last. Place the circles on the floor in no particular order, relatively close together. Children will enjoy hopping from one circle to the next in sequential order, which reinforces counting as well as coordination. Some children, especially preschoolers, learn best through the sense of touch. Allowing them to touch and feel numbers can be fun and easy. Cut a hole in the side of the shoe box big enough for your child's hand. If the box top says "five," place five surprise items in the box. The items can be the same or each item can be different. Encourage your preschooler to guess what the items are by feeling them. Choose items that are interesting to feel such as cotton balls, gummy bears, raspberries, chocolate kisses, forks, combs, crayons, jacks, and so forth. Invite the child to count the items as he removes them from the mystery box. This is a simple way for young children to practice writing numbers and letters. Pour sugar into a rectangular pan. Let your preschooler practice writing the numbers and letters in the sugar just like they might trace them in sand at the beach. Discard sugar after use or save it to repeat the activity often. Children enjoy practicing writing their name and simple words in the sugar. Many preschool math activities are geared toward teaching the one-to-one correspondence principle. This means children learn to understand how to point to only one object when they are counting, and to stop counting when all objects have been touched. Preschoolers need lots of experience with manipulatives to develop this skill. Take a piece of butcher block paper and write the number symbols from one to ten vertically on the paper. Give your preschooler an inexpensive book of stickers. Have the child put the correct number of stickers next to each number. Children may also enjoy drawing the correct number of pictures or gluing the correct number of pompons or buttons on the paper. Making necklaces by stringing round, colored cereal shapes on yarn is a preschool math activity that reinforces many skills. First, have your child sort the shapes by color, and then use the different colors to create patterns. Demonstrate the activity by stringing a pattern on the yarn and ask your child to create the same pattern. Let your child create a pattern for you to develop. After the necklace is strung, encourage your child to count the loops as he dons the necklace. Children love to practice counting backwards as they eat the cereal off their necklace. Note: wash hands before this activity! Taking precise measurements and correctly timing things are important math skills. One of the most fun ways to approach these skills is by cooking and baking. Some of the most memorable preschool math activities happen in the kitchen. Cooking and baking (not to mention the grocery shopping that come beforehand) involve math and teach your child how math is used every day. Though your child may be too young to measure things on his own, you can still mark the line in the measuring cup and have him pour. Show how measuring can determine less than and more than in a precise manner by measuring quantities of flour or sugar. Your child can see that two cups is less than four, but measure both quantities out to quantify the difference in measurements. Practice using timers and understanding how time relates to cooking. Take a pizza out of the oven at two-minute intervals so that your son can see what the effect of timing is in real life. After you are done cooking or baking, use mealtime to introduce fractions. If you bake a cake, show how you cut it in half, then into fourths and so on. This is a great way to show how fractions work and how everyone gets a piece of the pie. Preschool-aged children need to be involved with concrete materials and manipulatives in order to build pre-math skills. Most preschoolers are not ready to add and subtract until they can recognize the numbers from one to ten, count and sequence them forward and backward, and use one-to-one correspondence to count objects up to ten. Once your preschooler has mastered these pre-math skills, he may be ready for simple addition and subtraction activities using manipulatives. Big Math Activities for Young Children by Overholt, Dickson, and White-Holtz is a terrific book full of age-appropriate math activities.